Meticulously designed for unbridled imaginations, the cube works with your MHL/HDMI devices so you can transform your 5-inch screen into a 120-inch display. Discover how the tiny cube will make a big impression. Small, but made for big things, the cube is engineered for portability and performance. From grand adventures and strokes of genius to channel surfing and movie marathons, go places and take it with you, or stay put and be transported. Apple devices and latest generation Samsung devices require an adapter for compatibility. Contact RIF6 support to find out how to connect your device! MEET THE CUBE -- The CUBE though small in name is designed to make a BIG impression by turning virtually any setting into your own entertainment environment. The CUBE is great for: home cinema, office, education, entertainment or anything else you can come up with. 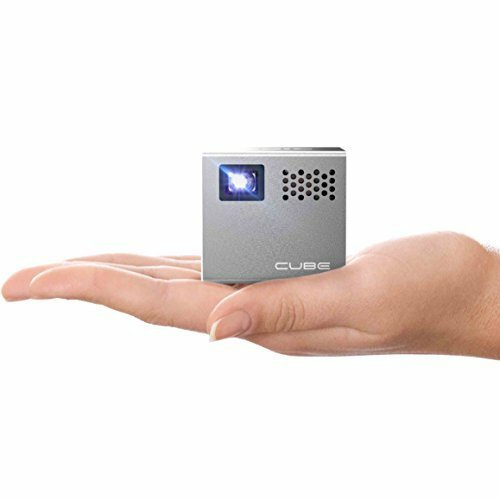 Equipped with its own speaker, internal battery and SD card reader, the CUBE is a completely autonomous projection unit that can instantly bring any room or space alive with light, colors and sound! THE CUBE IS YOUR SMART PHONE'S DREAM COME TRUE: Removing the frustrating limitations imposed by the size of your screen you can now: share your favorite media on the go, project your pictures, play your games and even stream movies directly from your Smartphone, Tablet or Laptop to a 120" display on any wall or ceiling around you --- all with crystal clear and vibrant video! The CUBE's single piece aluminium casing is built to be durable so it can withstand continually usage and look sleek and modern while doing it. It weighs less than a regular piece of fruit and is a powerhouse at just 2" cubed. So whether it is for work or play, your CUBE can immediately transport any setting or environment into a personal or professional presentation center. With this type of flexibility and freedom... WHERE WILL YOU TAKE IT? LONGEST LASTING LED LIGHT SOURCE -- Our proprietary LED digital based light source shows picture in stunning color and clarity. Unlike conventional lamp-based projectors, our LED Lamp can last up to 20,000 hours. That means you could watch 1 full-legnth movie evey day for the next 20+years with your CUBE lamp still shining bright. The CUBE is built on and powered by marvelous engineering including the latest advances in LED and optical lense technology. Connectivity: Micro SD, MHL & HDMI, Native Resolution 854x480 (WVGA), Throw Ratio 1.99:1 Dist/Width, Video Input up to Full HD 1080p, Dimensions 2"x2"x1.9", Brightness Full 50 Lumens. If you have any questions about this product by RIF6, contact us by completing and submitting the form below. If you are looking for a specif part number, please include it with your message.